TSMC delayed mass production of 16nm FinFET wafers, but according to the company, this has nothing to do with low yields and rather yields are approaching “mature levels”. TSMC aims to offer not only 16nm FinFET but 16nm FinFET+ as well which will have the nomenclature CLN16FF and CLN16FF+ respectively. According to company statements they expect a tapeout of around 50 products by year end. Using back-end-of-line interconnect (BEOL) of their 20nm SOC process (CLN20SOC) the company will utilize FinFET transistors to increase clock rate of chips by upto 40% (as compared to 20nmSoC). At the same time the FinFET+ process will offer an upto 15% performance increase on the same node. As far as power consumption goes, 16nm FinFET+ is estimated to reduce sippage by around 30% as compared to 16nm FinFET . Volume production is currently queued for the third quarter of 2015, with revenue streams by fourth quarter. Original volume production of the 16nmFF node was scheduled for early 2015, but it was postponed due to unknown issues. The foundry claims that yield is already approaching that of the 20nm SOC process (which is mature enough for commercialization) and that 16nm FF/FF+ will offer much better maturity risk than any other process. Ofcourse, since we are talking about the highest end offering here, it remains to be seen which products will utilize this node early on. 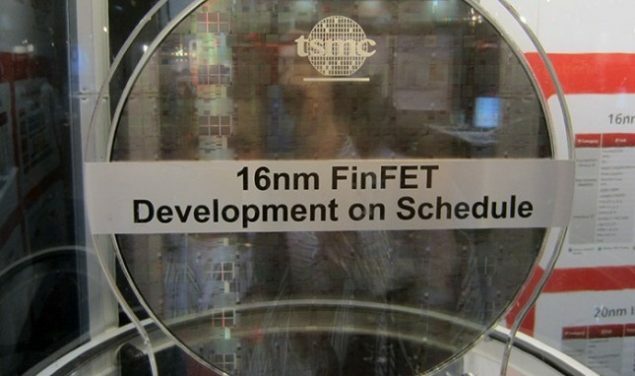 Nvidia was part of the original 16nm FinFET conference by TSMC, so their products are a very reasonable guess. It goes without saying, that 16nm GPUs will only come to pass this year if TSMC actually meets their schedule dead on – something other companies and even Intel have not been able to do.